Less than a month into my tenure on Retro Gamer, I learned something important about my editor Darran Jones: he’s not a fan of Dig Dug. Within a month, the fact that I’d even brought it up in the office prompted him to write this piece on why he loves Mr. Do! The argument is that it’s a better game than Dig Dug. But you know what? It turns out that it doesn’t matter. Sure, Universal’s game might well be deeper mechanically than Namco’s – but given that Mr. Do! 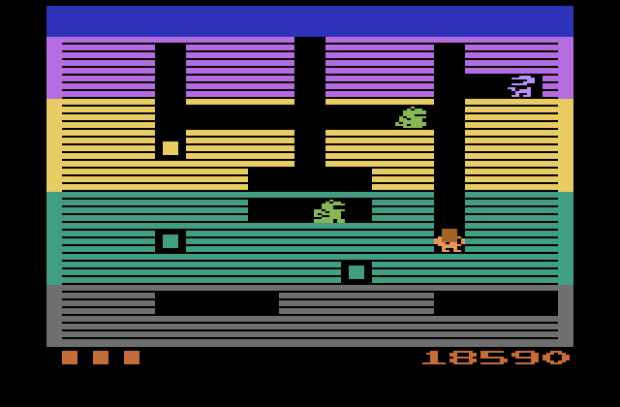 turned up six months after Dig Dug, it’s hardly a surprise that it builds on the formula. And while Darran’s probably right to say that Namco’s superior business network was probably a greater factor in Dig Dug’s eventual popularity than the design of the game, the truth is that we love it – I love it – precisely because it was so widespread. I’m a fairly adventurous retro gamer, in that I’ll frequently pick up games I never played and consoles that I never owned. Retro gaming isn’t exclusively a nostalgic pursuit for me, but that’s not to say that nostalgia holds no appeal – and when I play Dig Dug, that’s why I’m playing it. Sure, Mr. Do! is a great game. It just isn’t the one that my dad showed me how to play on his Atari 2600, and it isn’t the one that was eventually given to me with that Atari 2600 to become one of the first games I ever owned. Good game design is something to be treasured, but it’ll never be a substitute for childhood memories. There’s a lot to be said for cheering for the underdogs, but my affection will always be for the winning team in this case. That’s just how life is – sorry Daz!